Blog Home > Order Picking & Fulfillment > Don’t Climb that Pallet Rack! Racks aren’t designed for climbing. They lack guarding and handholds suitable for it. Pallets are both sharp and not suitable for handholds; they can have broken planks, protruding nails, and fractured stringers that can give way under a person’s weight or puncture a hand looking for a hold. Pallets that aren’t loaded fully may shift or slide, causing a fall. For a busy order picker, it’s tempting to climb up and get that one needed box when the floor level pallet is spent. If someone climbs a beam level high and steps on either the wire deck or on an improvised deck of loose boards or an empty pallet, there is a risk of a foot slip that can cause a fall or cause a live load to shift and fall with the worker. Rolling ladders are relatively inexpensive and take little time to move and use. Make sure they are readily available for aisles where carton or piece picking can occur on upper rack levels. However, this isn’t the safest method. 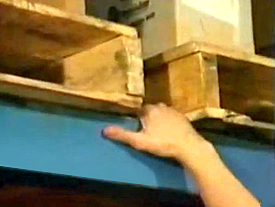 In very few instances should case picking of pallets above eye level. Those pallets should be for bulk storage only. This results in employees who cut shrink wrap to access cartons from a bulk pallet when the best way is to bring that pallet down to the floor level. Utilize forklifts to access palletized loads to bring down for safer picking. For loads where cartons from the back of a pallet must be accessed, this is the preferred method. If you’re using a platform ladder and the order picker must access items as deep as four feet into the rack, you risk him stepping off the platform and onto the decking or the pallet itself. Neither is a safe way to operate. Install rack safety nets or guarding on the outside of the bay. That doesn’t stop climbers on the pick aisle, but it can help discourage them in some places. Make rolling ladders easily accessible. Don’t force order pickers to walk a long way to get one. They will take the path of least resistance if it’s time consuming to get a ladder. Similarly, if you are picking pieces off elevated pallets, make forklift or power stacker access easy for warehouse workers. Train and re-train workers on the dangers. Discipline when someone is caught climbing. Be sure the aisles aren’t cluttered. This can discourage people from using the right method to access upper level pallets.